My buddy is interested in Amiga demos containing anti-Atari or PC stuff. It could be pretty much anything - silly scrollers, jokes, funny pictures or modules; just everything that comes to your mind. It doesn't necessarily has to be PC or Atari related – other platforms count too. He hopes to gather enough material to make a short video out of it. Thanks in advance!
" WHERE IS THE THRILL IN CODING NORMAL DEMOS ON HIGH END COMPUTERS? WE NEED TO CODE HIGH END DEMOS ON NORMAL COMPUTERS! ALL THE PC-SHITHEADS HAVE FORGOTTEN THIS! AMIGA AND ATARI FREAKS SHOULD STAY TOGETHER AND FACE THIER COMMON ENEMY: INTEL. I'VE GOT BOTH COMPUTERS, STANDING NEXT TO EACH OTHER: AN AMIGA AND AN ATARI, AND BOTH CARRY THE SAME STICKER: INTEL OUTSIDE (MAKES IT POSSIBLE)." Never forget the classics, M8! DISCLAIMER: I was absolutely involved in both (#1: ideas/brainstorming, #2: some of the stills +English translation). Well, one thing which comes to mind were the dozens of Amiga demos around 1994-1995 which parodied the "Intel Inside" logo. Russia is waiting for your will. Thanks LSL, Buckethead, Holid, Break and Moroz for your input! Much appreciated! 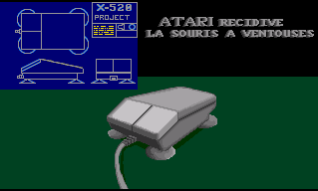 Those anti-Atari demos are the worst the Amiga scene has to offer, made by poor little braindead lamers unable to do any really productive or innovative. page created in 0.008131 seconds with 4 queries.